In some ways it feels these past two weeks have gone quick and at the same time it feels like we’ve been here a while. For our last day, we visited the Meiji Shrine. Located in Shibuya, Tokyo this Shinto shrine sits in some beautiful landscapes. There are numerous walking paths that cut through tall trees. There are also a few ponds that contain catfish and poi. 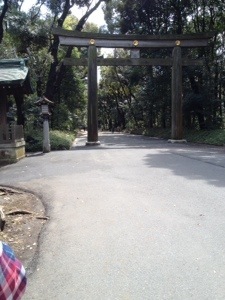 Here’s a pic of the tori gate. I took all my other pics with my DSLR. Hey you two. Don’t know if you are on the plane home or already home. Hope you had a wonderful time. Your blog is great and Mark you are going to have to set me up with one. I really enjoyed following you and Deniz through Japan. Only wish I could have been there for the shopping. Hope you bought lots and brought back some lovely items and maybe some SAKE!!! Welcome Home! Oh and Mark got a nasty cold here to so I guess it doesn’t matter where you go those bugs will find us all. Hope you get a decent enough sleep ..